The BMS is an integral part of the battery pack, as well as a major component in the complete system. The BMS controller may be powered by two sources, and is able to detects which one has power. For example, in an EV, the VS line is powered from the a supply that is on when the vehicle is plugged in; while the VL line is powered from the vehicle's sustain ignition, which is on when the vehicle is on, and a bit afterwards. See this tip on vehicle ignition for suggestions on how to wire the power in an EV. This is typically used for contactors, low power fans, accessories such as remote control or data loggers. Both grounds must be connected to the negative of the low voltage supply! The BMS controller sees if the interlock input is open or closed, from the Interlock connector. It also sees if the there is a request for the contactors to be on, from the ContReq pin of the control connector. In addition, the BMS detects which power source is used (see above), and, from the CAN bss, it may read the battery current (see below) and, any requests to turn on or off the contactors (see below). The BMS measures the cell voltages, the cell board temperatures and the battery current, and calculates minimums, maximums and averages. The BMS measures the voltage of each set of cells in parallel. Note that the temperature seen will be higher during balancing, due to the heat from the balancing resistor. It is also possible not to select any source at all. NOTE: In that case, you must make sure that the same current is not reported twice, once as Source Current, and once and Load Current (else, the BMS will think that the current is twice as high). The BMS controller can read the current from the CAN bus, from a message and byte with a certain scale factor and offset, all of which are programmable. It is also possible to ignore the reading from the CAN bus, by programming a non-existent CAN ID, or setting the units to 0. The BMS uses the above measurements to calculate certain parameters: DOD (and SOC), Resistance, Capacity and current limits. It uses those values to do its job of managing the battery, and it reports them through the CAN Bus. Depth Of Discharge (DOD) is a measure of the electricity that is extracted from a battery. It starts at 0 when the battery is full, and increases as the battery is depleted. Its units are usually AH. There is no direct way of measuring the Depth Of Discharge of a battery. In general, State Of Charge (SOC) is the reverse of DOD: it starts at 0 when the battery is empty, and increases as the battery is charged. Its units are usually in %. It is a more standard measure of state of the battery's charge than DOD. However, unlike DOD, it suffers as it could exceed 100 % when the battery is fully charged, and could go negative when the battery is fully discharged at a slow rate. Please see a white paper on Li-Ion SOC estimation. The BMS estimates the SOC based on points taken from the voltage vs. SOC curve for the cells used. Typical voltage vs SOC curve for a LiFePO4 cell. When configuring the BMS for those cells, you will need to look at the voltage vs. SOC curve on their spec sheet. Look at the curve for the lowest current discharge, such as for 1C discharge. Voltage at the "Full point"
Voltage at the "Charged point"
SOC at the "Charged point"
Voltage at the "Discharged point"
SOC at the "Discharged point"
Voltage at the "Empty point"
SOC calculation: gray = voltage translation; tan area: current integration. In addition, when charging, the SOC value stops at the "Clamp SOC" (nominally 90 %) and stays there, until the battery is full, at which point it snaps to 100 %. The dynamic resistance of the battery is a measure of its internal DC resistance under load (as opposed to AC impedance at 1 kHz). It is the slope of a straight line that goes between two operating points in the battery's I-V curve. It is affected by DOD, temperature and age of the battery. In order to measure resistance, the BMS must be able to measure the battery current, and the battery current must vary. If the battery current is 0 (or the current sensor is not installed), or the battery current is constant, the BMS cannot measure the resistance. The BMS calculates the resistance of each set of cells in parallel, by taking multiple snapshots of their voltage at a given current. This works well for applications in which the current varies considerably during use. For "Charge Sustain" applications (such as HEVs (Hybrid cars), the points are taken at a high charge current and a high discharge current. For "Charge Deplete" applications (such as BEVs (Electric cars), the points are taken at a high discharge current and a low discharge current, as there may never be a point with high charge current. For applications that use a constant current (such as a typical UPS) there is no way of measuring cell resistance, as there is only one data point. The BMS determines the resistance of the most charged and of the most discharged sets of cells, and calculates the average resistance. It adds all the resistances in a series string (divided by the number of batteries in parallel, if that's the case), to get the pack resistance. Battery capacity can only be measured in applications that fully charge and discharge the battery, such as PHEVs. In BEVs it is never desirable to completely run out of juice, so measuring the capacity may not be possible. In HEVs the battery never reaches either end of the DOD, so capacity measurement is not possible. In those cases that capacity can be measured, it is the DOD at full discharge. Because of the possibility of DOD drift, this is only done during a cycle that starts from fully charged and doesn't include any long period of other than discharge. In those cases that capacity cannot be measured, the nominal capacity is used instead. State Of Health (SOH) is normally 100 % and decreases as the battery is considered to be less than perfect. It is not strictly defined, and is implemented differently by different manufacturers. The BMS controller uses a combination of Cell Resistance (if available) and Actual Capacity (if available) to calculate SOH. Therefore, it is not able to calculate SOH in applications that draw constant current and that do not charge and discharge the battery completely. The BMS controller calculates a CCL (Charge Current Limit) and sends it to the devices that are able to charge the battery, to request that that limit not be exceeded. The rest of the system must pay heed to the CCL, to prevent damaging the battery. For example, the HLIM line could be connected to the battery charger, to shut it down. Or, the CCL could be sent to a motor inverter to disable regenerative braking. The purpose of the first two is to protect the battery. Therefore, normally, the CCL settings are based solely on the cell specifications, not on the system capability. That is, if a 100 Ah cell can handle a 0.5 C charge continuous, and a 3 C peak charge, then the BMS settings should be 50 A continuous and 300 A peak. The fact that the charger can only put out 5 A has no bearing on these settings. And, if regen can generate 500 A, that doesn't mean that you set the peak CCL to 500 A! No! The peak CCL is based on the cell capability (300 A peak in this example), not on the system capability (500 A peak in this example). The BMS is protecting the cells, so don't set the limits beyond the cell's specifications. The purpose of the 3rd one is to protect the system and is optional. By default the pack voltage limits are set at extreme values, so that it never has an effect. You should use the pack voltage limit only if there's a component in the system that cannot handle too high a pack voltage. The CCL is determined by cell voltage, pack voltage and temperature. The CCL will be set by whichever one of the above 3 items is most limiting. The CCL affects the HLIM, the CCL analog output, and the CCL value [A] on the CAN bus. The BMS controller calculates a DCL (Discharge Current Limit) and sends it to the devices that are able to discharge the battery, to request that that limit not be exceeded. The rest of the system must pay heed to the DCL, to prevent damaging the battery. For example, the LLIM line could be connected to a motor inverter to disable it. Therefore, normally, the DCL settings are based solely on the cell specifications, not on the system capability. That is, if a 100 Ah cell can handle a 1 C charge continuous, and a 5 C peak discharge, then the BMS settings should be 100 A continuous and 500 A peak. The fact that the load can draw 1000 A doesn't mean that you set the peak DCL to 1000 A! No! The peak DCL is based on the cell capability (500 A peak in this example), not on the system capability (1000 A peak in this example). The BMS is protecting the cells, so don't set the limits beyond the cell's specifications. The purpose of the 3rd one is to protect the system and is optional. By default the pack voltage limits are set at extreme values, so that it never has an effect. You should use the pack voltage limit only if the load cannot handle too low a pack voltage. The DCL is determined by cell voltage, pack voltage and temperature. The DCL will be set by whichever one of the above 3 items is most limiting. The DCL affects the LLIM, the DCL analog output, and the DCL value [A] on the CAN bus. The BMS manages the battery by balancing its cells, and requesting cooling if too hot. A balanced battery will hold the maximum possible amount of energy. A balanced battery is one in which all the cells are at the same DOD at some point. Because all the cells have different capacity, it is not possible for the cells to be all equally charged both when full and when empty. Therefore, they can only be balanced at a particular SOC. For "Charge Deplete" applications (such as BEVs, PHEVs or UPS), that point should be at 0 DOD (fully charged) because that point is reached after each charge (while the 0 SOC point may never be reached). For "Charge Sustain" applications (such as HEVs) it doesn't matter where cells are balanced, as, under normal circumstances, neither end is ever reached. This BMS balances the cells at 0 DOD (full battery), as this solutions is acceptable by all applications. In order to Balance a battery, some charge must be removed from the most charged cells, or some must be added to the least charged cells, or both. This BMS does the former: it uses passive balancing to dissipate some of the extra energy in the most charged cells as heat. Having done so, then the charger is able to put a bit more energy in all the cells. This process is repeated until all the cells are at the same DOD. At that point no more energy is dissipated for balancing. The state of the charger (charging or off) and the balancing process are independent of each other: whether the charger is on or off has nothing to do with whether cells are being balanced or not. Yet, the 2 processes work together to achieve a balanced pack. Because the BMS controls the charger, it's possible for the balancing current to be much less than the charging current. (In systems where a bulk charger remains on continuously, high power balancing circuits are required, as they have to have to bypass just as much current as the charger is putting in/) This is because the balancing current can stay on continuously, while the charger is turned on and off. By changing the On/off duty cycle of the charger, the BMS can reduce the average charging current to the same level as the balancing current. This plot shows an actual charging cycle with Lithiumate BMS, including the balancing process. Plot of battery voltage and current, showing the balancing process. An on/off line that is driven active whenever the temperature exceeds a threshold. This line can drive a relay or a low power fan directly. An variable PWM line that is at 0 % duty cycle until the battery reaches that same threshold temperature, and goes up to 100% as the temperature reaches a maximum. This line can drive a power circuit to drive a variable speed fan. 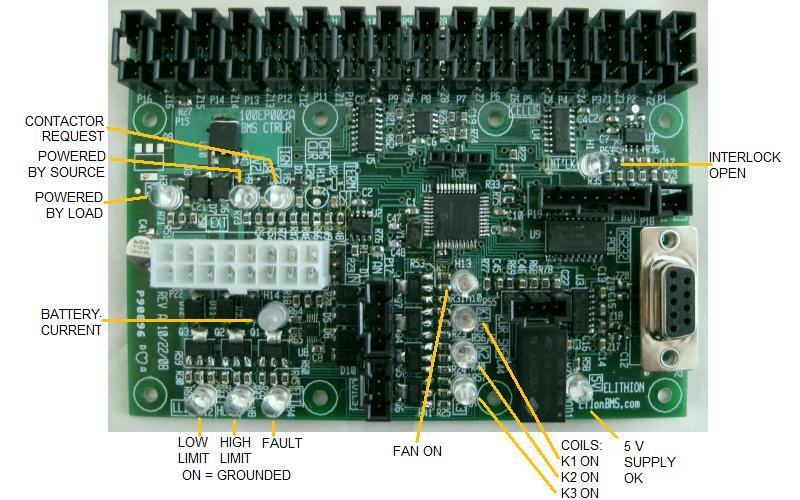 Function of LEDs, on a board level BMS controller. The BMS controller has multiple LEDs to report its status. The BMS controller includes hardware to drive contactors between the battery and the load. The contactors can be controlled through the CAN bus. If not controlled through the CAN bus, the contactors can be controlled with the dedicated Contactors line (such as from the vehicle's Ignition line). If the BMS controller sees a problem with the contactors, with isolation from the chassis, or with the load, it enters a Fault State. In the Fault State, the BMS controller does not drive the contactors. It does so without the need for contactors with feedback switches. The BMS master checks for the precharge resistor measurement in the HVFE first and if it is not used or if there is no HVFE, then the BMS will check the current sensor. If revs before 1.10, interlock fault is subject to the fault delay just as all other faults. If revs before 1.05, the Cell voltage averaging time constant is fixed at 30 s.
If revs before 0.98, the CCL and DCL used a single limit each (no Peak limit). Should any of these tests fail, the BMS controller will go into a Fault state immediately. Should that occur, the BMS controller will go into a Fault state immediately. It is the responsibility of the customer to make sure that the rest of the system reacts to this fault state, to protect the battery. Should either of these tests fail, the BMS controller will set the Isolation Fault state and a warning is given. The BMS doesn't activate the Fault output. The BMS will also put a fault code on the CAN bus. © 2008~2019 Elithion™, LLC. All rights reserved, except where noted by CC mark. Page published on Apr 24 2017.